The term begins with observation drawing, colour exercises and visits to exhibitions to learn how to use exploratory methods to find inspiration and think creatively. Through a series of projects you are introduced to the design process from the client brief through to the implementation of the finished installation. 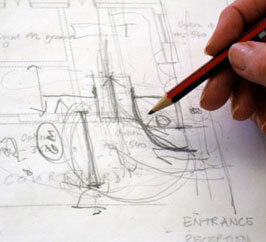 The language and design vocabulary of Interiors is delivered in lectures as well as within the studio based projects and covers all the various subjects required of a professional interior designer from contemporary and historic interiors to colour, light, form, texture, materials, furniture and interior and architectural elements. You will learn freehand and technical drawing skills and learn to develop ideas through an individual workbook. Throughout the course, emphasis is given to industry regulations on sustainability and wellbeing. 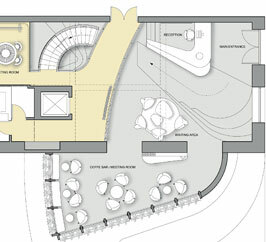 The first residential project is to design a one room garden project for an individual client and each brief is developed to understand the exact requirements of the client and to produce a visual interpretation of the brief into an abstract image board that will then be used to extract a colour and materials palette. Basic planning and ergonomics principles are covered and two dimensional drawings are developed into a scaled plan and elevations. The completed project is presented to include selected furniture, lighting and sourced materials. The second residential project is to convert a studio space into a loft conversion for an individually selected couple. The same design process is followed with additional skills learnt on identifying the requirements and function of the space, creating zoning and bubble diagrams and using the workbook to investigate various design options. A greater understanding on the ergonomics of the living, sleeping, kitchen and bathroom spaces are developed into finished plans and elevations. Three dimensional perspective drawing is taught along with thorough sourcing of materials, furniture and lighting. The skills learnt throughout this project are demonstrated in a completed presentation presented to a representative from the industry. The third Residential project is to develop the Bathroom project form the previous project into an installation pack. This part of the course concentrates on presentation techniques, survey, construction and detail. Focusing on the bathroom, you will explore and learn construction methods and appropriate use of materials and how to detail joints and junctions. Further technical drawing skills, computer aided design drawings and rendering techniques are explored. The studio project work is supported by a series of lectures on materials with visits to showrooms and suppliers to develop your awareness of current ranges, materials and furniture and finishes specifications. An introduction to the computer as a design tool using Vectorworks and Sketch Up Pro gains an understanding of the tools palette and how to use them to produce 2 dimensional drawings and 3 dimensional drawings. The fourth Residential project is to select a client and design a live/work space. This project will demonstrate a full understanding of all the components of the design process with work books illustrating the exploratory design drawings, presentation drawings, construction drawings, lighting plan, specifications, material boards and a written design statement. Advice and support will be given on choosing an appropriate subject so that your portfolio demonstrates an understanding of the design issues that you are interested in. This project will be delivered within the outline of project administration to demonstrate a full understanding of Residential Design. Working on two principal design projects, you will develop the skills and knowledge introduced in the previous projects, whilst being introduced to more advanced skills and design issues relevant to the commercial sector. Through independent research, you are expected to continuously develop a personal knowledge and understanding of design trends in colour, materials, furniture and finishes, and construction methods. Emphasis will be given to lighting design, detailed construction of furniture, professional practice and how to manage a design project. The aim of this project is to progress the design process, sketching, model making and presentation skills to produce a concept design for the retail/leisure sector. The project introduces ‘branding’ awareness and an understanding of the input the interior designer can have in generating ideas on a broader scale. Through this project, you will learn how to produce preliminary concept design proposals using lively and dynamic drawing skills that are suited to the fast paced commercial sector. You are given a Company Brand to research and analyse. This project examines space and form within a corporate office environment and how to interpret an existing company identity into a relevant interior. Focusing on the public areas you will explore architectural design issues and the necessity of being able to understand and design details, junctions and joints. By introducing further drawing and presentation methods, this project consolidates the skills you will need to be able to communicate ideas to clients and contractors. It also includes regulations, specifying sustainable materials, detailed staircase design and a lighting scheme. 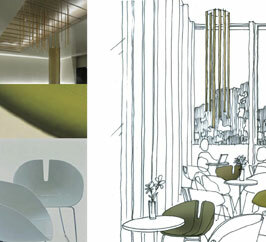 Of major importance in the Interior Design process is the organisation of the building project. Lectures are delivered throughout the course that help to give an understanding of the preliminary design and detail drawing programme, running the job, contract procedures, specification, budget costing, programming and implementing the project. How to work in practice with an understanding of dealing with the client, writing the brief, fee proposals, professional indemnity and relevant insurances. Time is given to allow you to work on the completed projects to produce a professional portfolio suited to job interviews. The final project encourages you to specialise in the chosen area of interior design you wish to pursue as a career and to co-ordinate the design skills that have been developed throughout the Diploma course in producing a comprehensive interior design project. Upon completion of this project your work from the whole year is assessed by the tutors and an external assessor and is expected to show evidence of a thorough understanding of the design process, skills and product knowledge required to practice as a professional interior designer. Feedback on your progress is given throughout the course at the end of each project. The final assessment for the Diploma award will be conducted internally by the main tutors and is moderated by a key member of the profession. An experienced interior design professional will conduct the assessment as a job interview where you will present your work and have an opportunity to discuss your career plans. A series of individual discussions help you to analyse and explore how to use past experience and transferable skills along with your newfound design skills and to develop your awareness of how and where to place yourself within the industry. Guidance is given to find appropriate interior design practices to approach for work experience. Each student presents their work at the final exhibition when prospective employers are invited to the private view along with consultants and suppliers who have helped throughout the course.